Maybe you didn't follow the installation guide. The most common mistake (if you see the product in the backoffice of Magento), is that you forgot to activate the Page cache. Go to System -> Advanced -> Nitrogento -> Cache fullpage, clic on “activate index.php” If you don't see nitrogento at all in the Backoffice, then it's because you didn't extract the package in the proper place, or forgot to change the rights, or have a custom admin template and didn't moved the file in the proper directory. Is the product delivered with a documentation? Yes, and a very complete one plus 2 short guides to setup / configuration & removal. Yes it does & it will. We already have some ideas to put in, some good tricks to adjust & test. 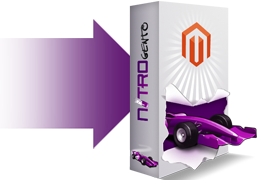 What versions of Magento are compatible with Nitrogento ? Do I have to code? No, it's a clic & play product, no code to insert/modify. Will the evolution be free for the existing customers or will we have to buy updates? Every new version of Nitrogento will be provided for free if you already bought it. What is the licensing system? The license is granted lifetime. Are all pages eligible to Full Page Cache? Almost. If some pages are “too dynamic” to be cached, you can exclude them from the configuration panel in your backoffice. This is not frequent but can happen, for example when a product stock is figure is display on a product on a page. This data is updated in a way Nitrogento won’t be able to precisely cache it so it’s better to exclude it. What are the limits of FPC? If a page can be served to anyone (not contains any kind of customization related to the particular visitor seeing it), it can be FPCed. If a page display special things related to a user (cart, map, rates for the delivery depending on geolocalisation, etc.) or any session specific informations (name, product number in the cart, out of stock, number of remaining product, etc. ), it can’t be cached by FPC. It’s better to use this kind of visual customization the latest possible during a visitor path (ie at the checkout if possible), that way you can use FPC all the way. Will you install Nitrogento for me? Is there any major incompatibility? Mainly the use of Nitrogento Full page Cache mechanism is not recommended along with Magento’s EE one, otherwise, no problem up to now. Why did you got rid of the Minify & Sprite features? Those features necessited to have a very clean template and we 97% customer having issues with poor quality template, that generated troubles. The other features of Nitrogento are “template resilient” and won’t be affected by HTML/CSS/JS issues, so we decided to lower the price of the product and remove those three features. Can I double check the tests & results you get? Sure. We are technical and scientific guys and we used some strong and reliable tools to test these results. The test scenarii are available to download in the Result section, along with the PDF reports. Feel free to run your own bench, using Funkload or another (realiable) tool to double check. The scenarii are made for Funkload but it’s quite easy to adapt them to another tool. For the Pagespeed tests, just use them in you firefox or use the www.gtmetrix.com site. Good question, this is very hard to get a reliable benchmark, especially when you overload a server. We used a quad core 5650 server with 4 Go of RAM for the tests, most of times. We runned at least 30 tests to be sure figures were accurate because you always have a small bug in every test. A cron launching, a monitoring tool flushing data to disk, some apache process that may start to swap and flush later on during another test cycle, etc. The joined test report are some among a lot, the one containing the fewest “measure glitch”. They are still not perfect and we used 30 data collection to get the most reliable results, so to put it short, yes, our data are accurate. We use the best benchmark available on the market: Funkload (even if some cute graphics could be added). Where can we propose tricks / things / ideas or report a bug or missing feature? Is Nitrogento compatible with Redis? Yes, and those two really get along very well !!! When should I flush the FPC (Full Page Cache)? The FPC is supposed to be updated when a product update happens in the B.O. If, for any reason, the FPC content seems to be outdated and Nitrogento doesn’t update it, you can flush it. If this situation is frequent, please notify it to us and gives us some details on the concerned page on your site. Will Nitrogento help us to better handle the peaks? Yes, definitely, if your landing page can be cached, we are talking of a x10 up to x20 factor. Why are Etags / Expire settings useful? This leverages your browser cache capability and once it gets the files once, it doesn’t download it again if they have not changed in the meantime. What is Custom bloc caching? This feature helps your developers to include the non-magento native blocs into the caching mechanism. Then a custom bloc (a creation made for your site but not embedded with Magento natively) will be able to be cached along with others. This feature is a good one but quite tricky to handle since it require a bit of development so a careful reading of the documentation is advised but this can really help a lot to achieve better performances. Is there a place to see the results?